Perfect for storing long and heavy articles, heavy duty cantilever shelving is quick and easy to assemble. This is a high-strength storage system for long items such as beams, pipes profiles, handled by mechanical means. 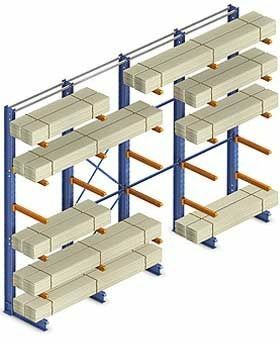 Heavy duty cantilever racking is especially designed to store long and heavy loads such as beams, profiles, pipes and timber. Loads stored on this type of shelving will be handled using lifting systems such as bridge and stacker cranes or forklift trucks etc., depending on the weight and dimensions of the load to be stored or the height of the rack itself. The cantilever structure consists of upright columns with one or two horizontal beams at the base to provide stability. A series of arms are attached to the uprights, on which the load is placed. These are made of hot-rolled metal and can be attached to the upright at variable heights. Loads can be stored on one or both sides of the racking. This system is made to order to you own specifications.